Comment: I would like to get an estimate for Replacing 6' wood fence, with a brick wall/fence, that is 6'7" from house wall to property line, and 1 3'6" along property line to existing chain link fence. Brick fence will have 5' tall columns, 6' apart and between columns brick wall to be 2'6" tall with wrought iron inserts to top of 5' columns. 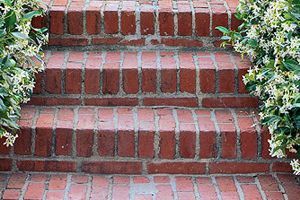 Comment: I want to put in a stone walk way from back stairs to side gate. at base of staires like path leading off to paito. left and right side of walk way will be files in with pebbles. Comment: I need 2 existing crushed granite walkways in my back yard redone with a surface that is much less apt to wash out. Comment: Replacing siding for the whole house and installation and wood that is old. San Antonio Brick & Stone Masonry Contractors are rated 4.69 out of 5 based on 669 reviews of 36 pros. Not Looking for Brick & Stone Contractors in San Antonio, TX?